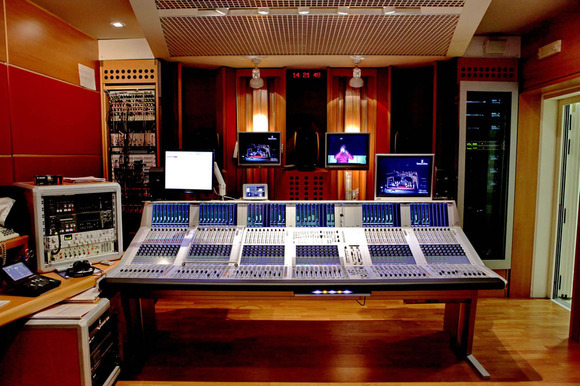 MILAN, Italy – Italian state broadcaster, RAI, has taken delivery of its first four Studer Vista 9 digital mixing consoles from Italian distributors Leading Technologies (LT) — including a production console for the control room at the famous La Scala Theatre in Milan (Teatro alla Scala). All formed part of a single tender resulting from a unilateral decision to move up to Studer’s Vista 9 platform. The new console has been installed in the RAI control room at the theatre, replacing the previous Vista 8, and will be used for live broadcasting for radio and TV, as well as recording of operas and classical concerts. This will meet the venue’s wish for upgraded facilities within the Vista architecture, with the emphasis on 5.1 production. The desk is configured with 64 Mic inputs from the stage plus Line and AES I/O for local effects and machines and two MADI interfaces for multitrack recorders. This is one of four Vista 9s supplied by the Studer distributors, who over the years have provided Studer solutions for all four RAI production centres — in Milan, Rome, Turin and Naples. A further Vista 9 has been installed in the RAI auditorium in Turin, supplied along with a Vista Compact Remote Bay to work in parallel. Replacing the venue’s previous digital console, this will be used for live broadcasting or the recording of classical music, since Turin is the base of the RAI National Symphony Orchestra. The state broadcaster took the decision based on the success they had enjoyed with earlier Vistas, and their familiarity with the desk ergonomics. The other stand-out features which defined this decision were the TFT metering and the HISTORY mode, which records events such as overloads in the audio path of each channel, and highlights them in red on the channel waveform. This enables the operator to review which channel had such an event, up to 30 seconds after the event has occurred. The Vista 9 is configured with 88 Mic inputs plus Line and AES I/O for local effects and machines and two MADI interface for multitrack recorders. At their Rome broadcast facilities, RAI has similarly upgraded its former digital desk to a Vista 9 in the radio production centre of a general purpose studio, which is predominantly used for live music, talk shows and drama. Once again, the HISTORY mode and TFT metering features will future proof the studio’s needs. This Summer, another studio, identical to the first one, will be upgraded with the second Vista 9 assigned to Rome. Both Vista 9 consoles have the same configuration, with 48 Mic inputs plus Line and AES I/O for local effects, and MADI link to the studio’s monitor mixer. This is the latest in a long list of Studer desks supplied by LT to Italy’s state broadcaster. Aside from the four Vista 9s, this includes two Vista 7 and a Vista 5 (for radio), as well as two Vista 8s and three Vista 5s for television broadcast.